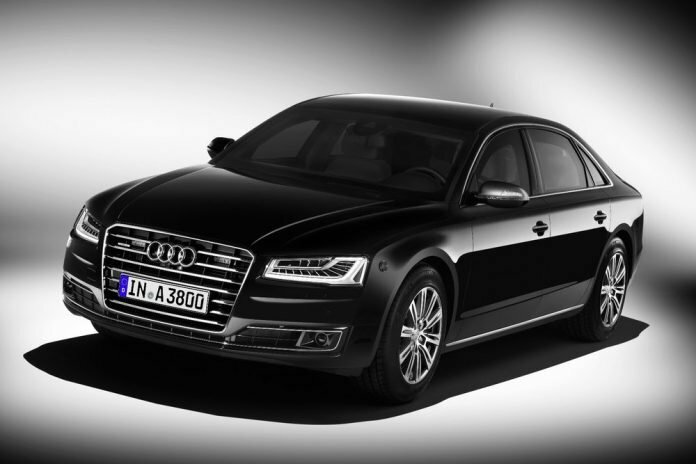 The A8 L Security sedan is Audi’s most secure car ever. It packs enough reinforcements to survive armor-piercing assault rifle fire and hand grenade explosions. In addition, it can blow its door hinges apart for emergency exit, extinguish its own flames, and attract attention of passers-by and call out for help. At first glance, the new Audi A8 L Security looks like any other A8 running on the road, but it’s what lies under the skin that makes it so special. Audi has built it using lightweight but high-strength materials including aramid fabric, special aluminum alloys and hot-formed armor steel. This means it can withstand gunfire. Reinforced aluminum side sills and a special-alloy armor-plated floor can help shield occupants from smaller explosives. The window glass has also been reinforced. Audi uses a multi-layer construction with a splinter-inhibiting polycarbonate inside layer on the door windows, windshield and rear window. The A8 L Security includes enhanced technology. In case of emergency, when the window glasses are up, an integrated intercom allows occupants to communicate with the outside world – using a loudspeaker built into the front grille and internal/external microphones. More high-tech features include emergency exit – at the press of a sealed switch, you can blow up the pyrotechnic-activated fracture bolts, separating the door from the vehicle body for a swift exit. There is also a heat-sensor-activated, push-button fire extinguishing system integrated into the underbody. It puts out flames around the engine compartment, underbody, fuel tank and wheel arches. All those security features are absolutely mind blowing. However, often the best plan is to escape an attack before encountering it. The car’s top speed of 130.5 mph (210 km/h), though not quite high, can save the day – the speed has been limited to protect the tires, which are equipped with emergency flat-running hardware. The A8 L Security is available with the 4.0 TFSI and with the W12. With the W12 variant, it hits 62 mph (100 km/h) in 7.1 seconds.